Toyota is now all set and ready to bring about its compact car right in the Indian market along with its upscale of production and services in India in the last few years. There have been some subsidiary shows unveiling today under the banner of a first compact car to be launched in India. This is all about bringing forth a concept version of “Etios”. 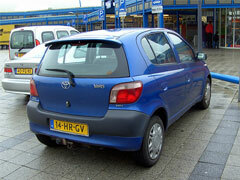 “Etios” has been a compact car that got speedily developed to become adaptable and successful in the Indian market. The tenth Auto Expo in India has introduced this car to the Indian customers.The show will run till January 11th in New Delhi. The Etios has been aimed with the new nuclear family structure that is more prominent in India right now. There is a growing automobile business for the cities in India and it is bringing a spacious and roomy car that is class above from the rest of the smaller cars. The stylish Etios is bringing abundance of storage facilities and enough room for you to be comfortable while being trimmed short of anything extra lugging with it! At last Toyota has sensed the need of such users in India who have small families or have to drive in busy streets having tiny space to drive freely. Toyota entry in compact car launching is a good news for Toyota lovers. Nice post !! !